HPSC Assistant Prof. College Test Schedule & Admit card 1647 Posts. 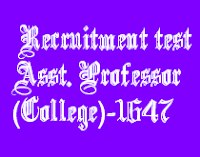  Home  Test  HPSC Assistant Prof. College Test Schedule & Admit card 1647 Posts. 1. Zoology, Fine Arts 27.08.2016 03:00 P.M. to 05:00 P.M.
2. Botany, Music (V) 03.09.2016 03:00 P.M. to 05:00 P.M. The Admit Cards showing date, time & venue of Recruitment Test and Instruction to Candidates for the aforesaid Test will be available on Commission's website from 12.08.201.6. The candidates who find any error in the Name, Father's Name, Category, Date of Birth etc. in their admit cards, can contact the Commission's office "in person or on telephone No. 0172-2560755 or mail at apexam2016.hpsc@gmail.com upto 24.08.2016" for necessary rectifications in the Admit Card. Any type of rectification in the admit cards will not be carried out after 24.08.2016 by the Commission. 1. A physically Handicapped (blind/ partially blind / Locomotor disability) candidate who wants the help of scribe for writing his/her papers with extra time @ 20 minutes per hour, the candidats has to make his own arrangement of a scribe. The scribe should be a studying student upto 10+2 and his/her photo and other particulars should be verified by the principal of the institution in which the student is studying. Physically handicapped candidates suffering from Locomotor disability and do not want the help of a scribe, extra/compensatory time will be allowed @ 20 minutes per hour for examination on production of a medical certificate issued by a Medical Board clearly stating that the candidate's writing ability is severally affected due to his/her handicapness. In both the above cases, the candidate have to apply at least l0 days before the commencement of Recruitment Test for which the permission will be granted by the Commission. No such permission will be granted by the centre supervisor. 2. Candidates are directed that they may download the admit card on A-4 size paper so that their photos & other particulars can easily be seen / verified. Candidates having small size Admit Cardt witir illegible photos / signatures will not be allowed to enter in the Examination center. 3. The Admit Card is not being issued to the candidates who had applied in response to Advt. No. 7/2014 under BC category and have yet not updated their BC category into BC-A or BC-B category as per Advertisement No. 10/2015.